On the Leigh Branch of the Leeds and Liverpool Canal near to its Bridge 11. 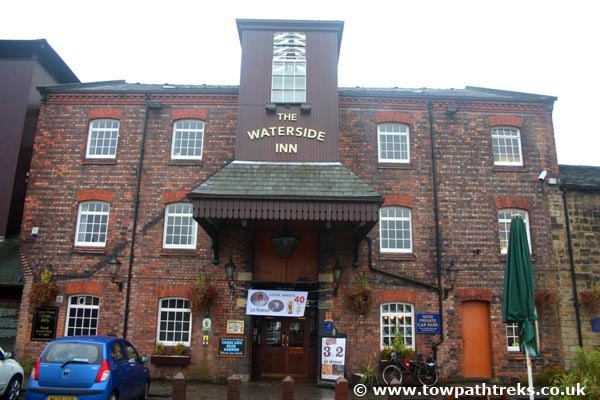 The pub is in two Grade Two listed buildings, both former canal warehouses, one built of stone in 1821, the other red brick built in 1894 when the canal company modernised. This pub seems more interested in wine and cocktails than real ale. It has the usual pub food with a good reasonably priced menu. There is a grass area with picnic tables by the canal and decking by the old loading bay. There is a large car park and an Aldi next door that would be handy for boaters. Pub: 9 out of 10 with 20 votes. Beer: 9 out of 10 with 21 votes. Food: 9 out of 10 with 16 votes.